72 Hour Slimming Pill - Diet Pill Reviews: Does 72 Hour Slimming Pill Really Work? The 72 Hour Slimming Pill is a weight loss product designed to help dieters lose weight in just 3 days. Intended for short term use, manufacturers claim that consumers will experience drastic results over the course of the 72 hour period. As the 72 Hour Slimming Pill should not be taken for extended periods of time, some consumers choose to take the pill occasionally in cycles. In such cases, most consumers tend to lose 5-7 pounds during the first 72 Hour Slimming Pill cycle; however, some average individuals report weight loss results of approximately 10 pounds during the first cycle. How Does the 72 Hour Slimming Pill Work? Juniper Berries – Juniper Berries provide consumers with a diuretic effect, which increases the body’s urination processes, ultimately allowing the body to flush toxins from the kidneys. Ginger Root – Ginger root has been used for hundreds of years to provide consumers with a variety of health benefits, such as boosted blood flow to the heart, while also working as an aid to decrease feelings of illness and/or nausea. Dandelion Root – Dandelion root is often used to lower levels of harmful cholesterol (LDL), while also stabilizing blood sugar levels. Adding to this, dandelion root also works as an effective diuretic, aiding in the detoxification process. Caffeine – Caffeine helps boost consumers’ energy levels, while increasing one’s ability to focus, concentrate, and burn fat. Potassium Gluconate – This ingredient reduces the body’s blood pressure while also helping to maintain the body’s fluid levels. The ingredients have been specifically chosen for immediate and short-term weight loss results; therefore, consumers should not consume this pill or these ingredients for a long period of time. Some consumers report feelings of dehydration while taking the pill. The 72 Hour Slimming Pill has not been approved by the Food and Drug Administration. Side effects and long term effects are generally unknown. As this is a short-term weight loss solution, some dieters report an experience of weight gain after their 72 hour pill consumption. 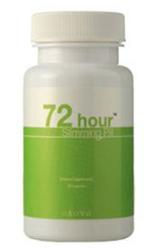 How Do I Purchase the 72 Hour Slimming Pill? Dieters can purchase this weight loss product online, as it generally costs approximately $30 per bottle. Each bottle lasts just 3 days, and consumers can often purchase more than one bottle at a time in order to receive an added discount.